Meningitis, a medical condition caused by the inflammation of the membranes around the brain and spinal cord, can be caused by a viral, bacterial or fungal infection. The classic symptoms of meningitis, including flu-like symptoms, high fever and rash, usually appear between 13 and 22 hours after the onset of the illness, according to a study conducted by Dr. Matthew Thompson and published in "The Lancet." This time is critical, as the average time until patients are ill enough for hospitalization is approximately 19 hours. The study published in "The Lancet" established that there are three signs, leg pain, cold hands or feet and pale skin, that typically present within eight hours, and noticing these symptoms can be critical to a successful recovery. The exact reason for why patients feel leg pain as a symptom of meningitis is not clear. Doctors believe that the leg pain could be in response to the chemicals the body releases in response to the inflammation. Some of the chemicals the body releases to fight inflammation, such as cytokines can cause intense muscle contractions which results in the leg pain. Meningitis, especially bacterial meningitis, is a serious condition. The bacteria causing the inflammation of the membranes surrounding the brain and spinal cord also infect the bloodstream. As the body fights to protect the internal organs from damage from the infection, the flow of blood slows down leaving the extremities, such as hands and feet, feeling cold from lack of blood circulation. The appearance of pale skin is an early sign of meningitis. This sign occurs due to the lack of blood circulation as described above for cold hands and feet. A high fever is often one of the first signs of meningitis especially in young children. The fever is in response to the infection causing the inflammation of the membranes around the brain and spinal cord. 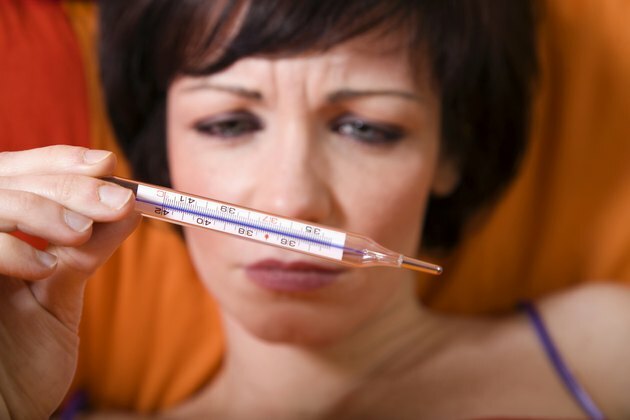 As the body attempts to fight off the infection, body temperature rises resulting in fever. Flu-like symptoms, including headache, tiredness and malaise (a general ill feeling) are classic symptoms of meningitis. These symptoms are non-specific, meaning that they may be symptoms of a variety of conditions, so are therefore difficult to use to diagnose the meningitis. A rash on the skin is a common symptom of meningitis that usually appears about 13 hours after the onset of illness, according to the study in "The Lancet." The rash appears as tiny red marks on the skin that do not go away when glass is pressed against the skin. The hallmark symptom of meningitis is a stiff neck. Because the infection causes inflammation of the membranes around the brain and spinal cord, the neck becomes difficult to move.